Sic Bo Rules Online | Bet and Roll the Dice, Asian Style! Sic Bo Rules Online | Bet and Roll the Dice, Asian Style! Sic Bo is a wildly popular dice game in Asian gambling destinations like Macau, but it has yet to gain mass appeal in America or Europe. Online Sic Bo could very well change that, as it allows players from around the world to access the dice diversion 24/7. Many players new to Sic Bo are intimidated by its colorful and crowded table, but once you understand the premise of the game it’s actually very easy to follow. Sic Bo is also sometimes called Hi-Lo or Big-Small. Like craps, Sic Bo is played with dice, and the object of the game is to guess the outcome of rolling those dice, but that’s where the two games’ similarities end. Sic Bo is played with three dice which are shaken and read exclusively by a casino dealer. The dealer rolls the dice inside a special shaker, and once the bets have been collected the top of the shaker is removed to reveal the outcome of each roll. The Sic Bo table is covered with a betting layout, similar to the ones used for craps and roulette. 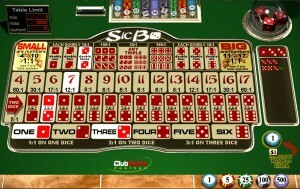 What makes the online Sic Bo table unique is that it not only features potential number totals for the dice, it also offers images of the dice themselves and posts the payouts for each roll directly on the table. Players may bet on the properties of one, two or all three dice by placing their chips directly on the corresponding image. To make the game even easier, once the dice are revealed the winning bets are lit up. It’s important to understand the Sic Bo betting layout, so you know where you should be placing your chips. The bottom row is all of the possible results for a single die. If only one die lands on the number on which you bet, then you’ll win your bet back, but if two or three dice display that number then you could win two or three times your bet. The second to last row of the Sic Bo layout shows all of the possible two dice combinations, excluding doubles. The row above that shows all of the possible values for three dice, excluding triples. The payout for each of those values is printed on the table. At the top corners of the Sic Bo layout are the Small and Big group bets. A Small bet covers all totals under 11, excluding triples. A Big bet covers all totals from 11 to 17, excluding triples. Between those two bets are all of the possible double and triple bets. Any double bet will pay out 11 times the original wager, while each triple bet pays 150 times the original wager. There is also a wager that covers any of the six possible triple combinations and offers a payout of 25 times your bet. Betting on the outcome of only one or two dice does not limit you to specific dice; so long as any combination of the dice reflect your bet you will still win. Players can bet on as few or as many different outcomes as they please. To wager, you need only place the desired amount of chips on the space on the betting layout that reflects your desired bet.